A big part of reaching FIRE is having a plan for the lifestyle that you want after retirement. Many people work “one more year” because they fear quitting the workforce and finding out that they don’t have enough financial resources to live happily ever after. Fortunately, the level at which money drives happiness is (relatively) low at about $75,000. 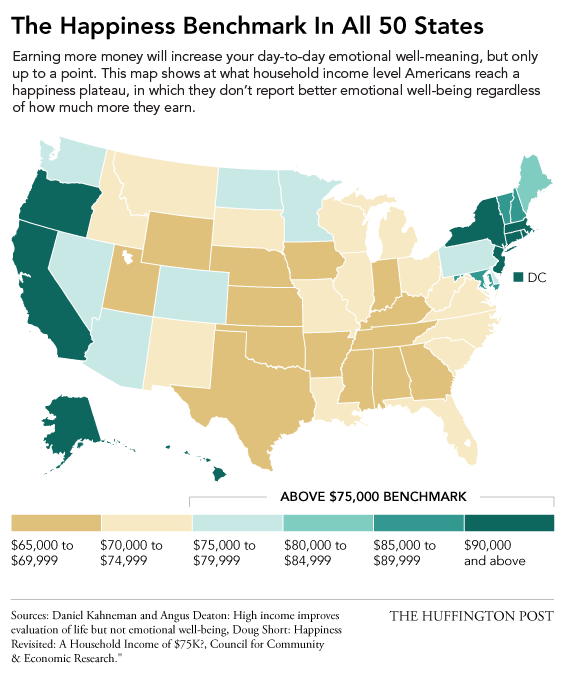 The Huffington Post published this graphic and an article last year on how much money one needs to earn in order to max out your emotional well-being. It turns out that you don’t need a six-figure income to be happy, although some states approach that level due to their high standard of living. To achieve a $75,000 retirement lifestyle, one would need to save a $1.85 million nest egg. A lot of money for sure, but achievable by working hard, banking pay raises, and saving about $20K per year for 20+ years. The information for this graphic comes from the Council for Community & Economic Research. It helps me frame my thinking about FIRE. I’ve achieved FI, but I am still working because I’ve wanted to be doubly sure that I have the financial might to make my retirement dreams come true. It reminds me that rather than chasing a bigger house, fancier car, or even more amazing vacations, what really drives happiness are your family, friends, and activities that are personally satisfying.